you’ll be surprised by what you find. Two sister towns, Peterson and Linn Grove, nestled next to the Little Sioux River, offer a charming getaway to enjoy a little history and the simple things in life. Peterson has the distinction of being Clay County’s first settlement, established in 1856 on the floor of the Little Sioux River Valley. Its neighbor city, Linn Grove, home to a historic dam, has been around since 1910. Both are as picturesque as a vintage Iowa postcard. And both sit right on the Iowa Glacial Trail Scenic Byway, a 36-mile loop that begins in Clay County on Hwy. 10. Fall suits this corner of Iowa perfectly. To see the area’s splendor up close, check out the wonders of the prairie at the Prairie Heritage Center, a few miles outside Peterson. The center offers environmental education and features a birding bonanza room with crafts and displays, including a section on the folklore of birds and how to “talk turkey.” Buffalo also roam the adjacent 160 acres (1-712-295-7200; http://www.prairie heritagecenter.org). History is plentiful. Peterson Heritage Inc. can help set up a tour of Peterson’s historical gems — its office is located in one of the historic houses, the Boarding House of 1882. Other sights include the Fort Peterson Blockhouse, a fort constructed in 1862 by Civil War troops, and the Rock Forest School, one of the county’s first frame schoolhouses (1-712-295-8889; www. petersonhistory.org). Jim’s History Barn in Peterson is an “American Pickers” dream. Owner Jim Hass has filled a restored 1928 barn from wooden floor to rafters with collections of western memorabilia, mounted wildlife, rows of military items from the 1700s through World War II and thousands of other items. Admission is free, and a bonus is that Hass is a font of knowledge on the area’s history (1-712-295-6551; http://www.peterson history.org). 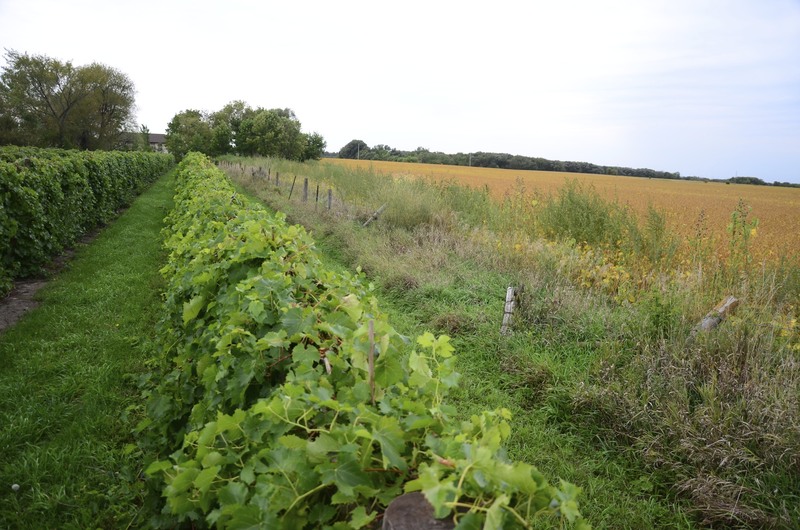 Just a few miles from Linn Grove and Peterson farmlands is InnSpiration Vineyard, which covers 6 acres and whose tasting room overlooks a pond. Owners Paul and Sheila Thomsen have created a Midwest wine lover’s oasis, complete with acoustic music on weekends and annual grape stomps. Be sure to try the winery’s Touch of Sun, Squirrely Shirley or 2010 Frontenac Dry (1-712-296-4966; www.innspirationbandb.com). Normally, the towns of Peterson and Linn Grove hover around a few hundred residents each. But if you roll into Peterson on the first Saturday of October next year, be prepared for the Hiney Wine & Arts Festival, which can draw 2,000 people. Crowds converge on Kirchner Park to browse artists’ wares and taste samples from beer and wine booths. The InnSpiration Bed-and-Breakfast sits across the pond from the winery, and its four bedrooms feature queen beds, cozy fireplaces and double whirlpool baths. We stayed in the Lake Room, which overlooks both the rows of grapevines as well as the busy farm fields. From your deck, you might hear the soft bleating of sheep from the pastures. Breakfast included eggs Benedict, homemade jams, juice from the grapes and fresh honey from the owners’ beehives (www.innspirationbandb.com). The area isn’t flush with the sort of dining choices we enjoy in the Twin Cities, but local eats aren’t hard to find. Lon’s Lounge is the place locals mention first for burgers and beer. It opened last October in Peterson’s quiet downtown. You’ll find owner Lon Frerichs waiting behind the bar as you enter. The Lon burgers were a finalist for the area’s “Best burger” in a contest by a local radio station (225 Main St.; 1-712-295-7006). If you’re looking for a down-home breakfast, head to Sue’s Diner, right across the street from Lon’s (224 Main St.; 1-712-295-6231). For more information about visitng the region, go to the website of the Clay County visitors bureau at http://www.explore claycounty.org.